"This is my husband's favorite cube steak, passed down from his grandma. Yummy steak with great gravy as long as you're patient while making the gravy. Best served with rice." Whisk flour, cornstarch, 1 teaspoon black pepper, and 1/2 teaspoon salt together in a shallow bowl. Spread 1 tablespoon of the flour mixture onto a plate; press each cube steak into flour mixture to coat completely. Place coated steaks on a work surface and pound each several times with a meat tenderizer on each side to pound flour into steak. Pound each steak a second time to further incorporate flour mixture into the meat. Melt butter in a large skillet over medium-high heat until skillet is about 350 degrees F (175 degrees C). Cook steaks in hot butter until browned, 2 to 3 minutes per side. Transfer steaks and any stray pieces of meat to a plate and tent with aluminum foil to keep warm. Let skillet cool briefly. Heat the same skillet over low heat. Pour enough milk into the skillet to cover the bottom of the pan. Whisk 1 tablespoon flour mixture into hot milk until gravy has a cream-like consistency, 10 to 15 minutes. Add more flour mixture as necessary to thicken gravy. Transfer any steak scraps back into the skillet and season gravy with salt and black pepper. Place hot steaks on plates and top with gravy. When the flour sets into the cube steak it simply means that the dryness has been moistened by the juices of the steak, so it is not dry anymore. The gravy thickens slowly, do not add more of the flour mix until you are sure that it is done thickening. The gravy will thicken as it stands as well so it should be served very soon after cooking. Never leave the gravy unattended, you should be consistently stirring or adding. The more milk and flour mix you add the less meat flavor. Be careful to taste often and not make so much gravy that the meat taste goes away. Good method, but needed additional seasoning. I added a bit of beef soup base to the gravy mixture, but next time I would add sautéed mushrooms and/or onions and garlic. I used just flour instead of cornstarch, and instead of milk, used one cup of beef bullion. Added sauteed fresh mushrooms, turned out delicious! WONDERFUL! 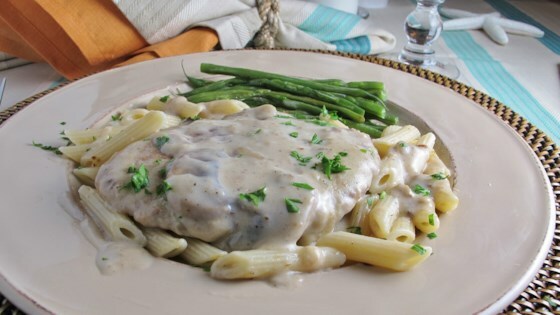 I made this for dinner and my 17 yr old boy doesn't "do gravy" but he had this and LOVED IT! He went back for seconds. Very tasty, thank you.